In support of #UniMentalHealthDay, Residential Life worked with the Wellbeing team to create a ‘flashmob’ style video in All Saints Park on March 1st. Staff and Residential Advisors met, despite the sub-zero temperatures, to spell out the day’s hashtag as well as #ManchesterMetProud. 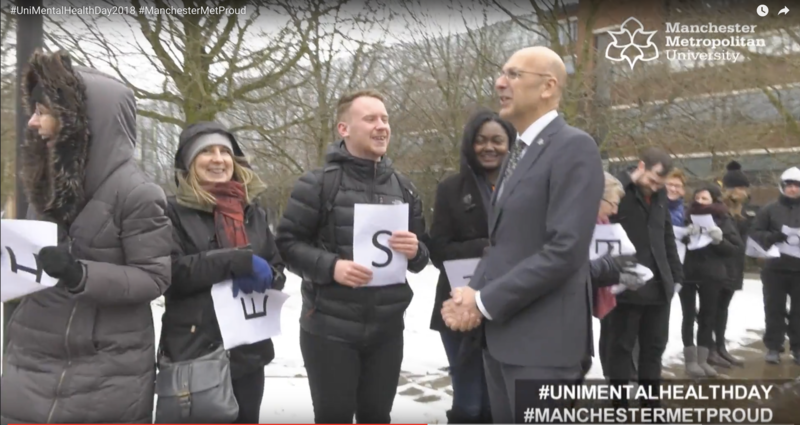 The Vice-Chancellor joined the celebrations and discussing Mental health, explained that is “a really important societal issue and we [Manchester Met] absolutely play our role. It’s great to see so many staff and students involved.” The final video can be viewed online.